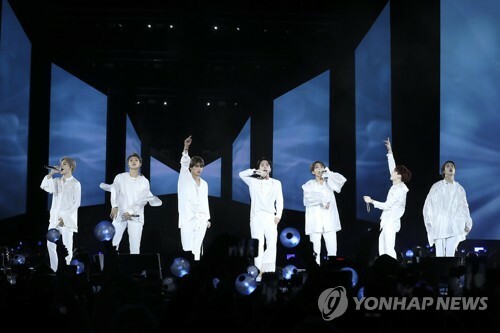 SEOUL, Oct. 9 (Yonhap) — Globally popular K-pop boy band BTS will be decorated with a cultural medal by the government for their contribution to spreading the “hallyu” wave of enthusiasm for Korean culture, the prime minister said Tuesday. “The government decided during a Cabinet meeting yesterday to award a Hwagan medal to the proud BTS,” Lee Nak-yeon said at a national ceremony here to mark the 572nd birthday of the Korean alphabet, or Hangul, which was invented by King Sejong of the Joseon Dynasty. During the Cabinet meeting presided over by President Moon Jae-in, the prime minister praised the band, saying that they have contributed to spreading not only “hallyu” but also Hangul. The seven-piece group topped the Billboard 200 main albums chart twice in a year recently with its two new “Love Yourself” albums, an achievement pulled off only by British-Irish band One Direction a few years ago. Last month, it became the first-ever K-pop group to speak at the United Nations, telling the world’s youth to listen to their inner voices and resist the pressure to conform.